For over two and a half decades, Minnesota has been ground zero for an ongoing national experiment in public school charterization. In the coming months, the Institute on Metropolitan Opportunity will be producing a series of reports on the results of that experiment. In 1991, Minnesota passed the nation's first charter school law. By 2016, despite continual controversy over their academic impact and educational role, there were over two hundred charter schools in the state, with more opening every year. In Minnesota, the past, present, and future of charter schools collide. The principles of modern charter schools were largely developed in the Twin Cities, by civic organizations, policy scholars, and politicians. As an early adopter, the state has often served as a testing ground for political tactics and policy measures related to educational reform. Minnesota's charter sector is unusually fragmented, representing the range of forms charter schools can take. The state's charters run the gamut from remedial institutions for children of color, to online-only schools, to suburban classical academies. Minnesota also continues to experiment with new types of charter regulation, such as by adopting unusual and controversial policies for school accreditation. The Institute on Metropolitan Opportunity has produced several previous studies of Minnesota charter schools, focusing on school segregation and performance. These studies reflected a broader national debate about whether charters improved test outcomes. However, as charter schools have expanded nationally, they have come under broader scrutiny. Today, the debate over charterization extends far beyond performance alone. Recent reporting and research has raised questions about who these schools serve, how they are funded, how they are regulated, and their role in education politics. Answering these questions in Minnesota requires new dimensions of analysis. Towards that end, the Institute on Metropolitan Opportunity is launching a new research initiative. Called The Minnesota School Choice Project, it will analyze the state's charter school industry from a variety of perspectives. This research is intended to provide new insight into the effectiveness and impact of charter schools in the state, and serve as a launching ground for a more robust understanding of the role charter schools play in the educational ecosystem, both in Minnesota and nationwide. Charter schools continue to underperform traditional public schools, after controlling for student demographics and other characteristics. In Minnesota, charter schools are at the forefront of school segregation. Of the 50 most racially concentrated Twin Cities schools, 45 are charters. There is a social science consensus that racial and economic segregation produces academic, professional, social, and personal welfare penalties for students, while integration produces benefits in the same areas. 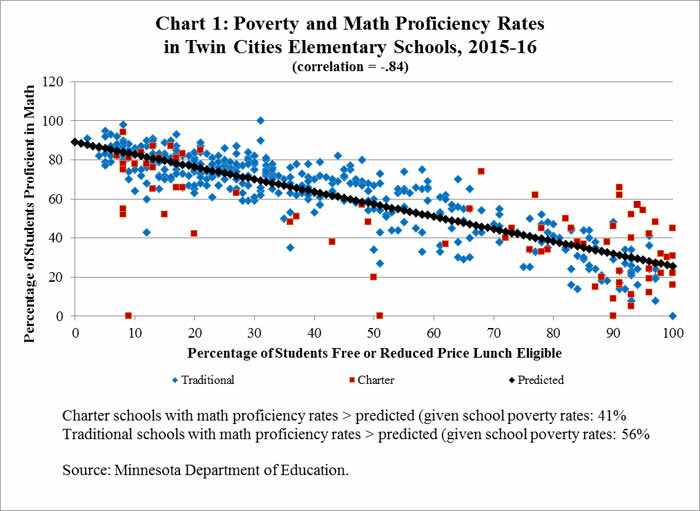 Twin Cities charter segregation is driven almost entirely by the growth of highly-segregated "poverty academies" - schools that attempt to close racial achievement gaps by narrowly focusing on disadvantaged groups. 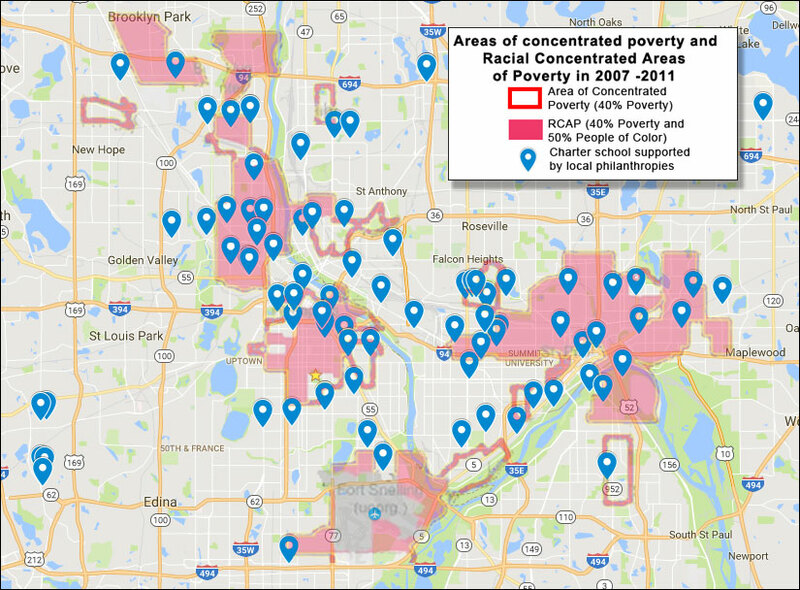 Because Twin Cities traditional public schools are not typically racially homogeneous, the growth of poverty academies has led to levels of racial segregation heretofore unseen in Minnesota. Higher-performing poverty academies only appear to outperform traditional public schools in environments of near-complete segregation - which, combined with demographic evidence, suggests student screening plays an important role in producing their achievement gains. Even ignoring the potential effects of student screening, poverty academies underperform schools with low or even nominal levels of racial integration. The evidence suggests that, under the most favorable set of assumptions for poverty academies, racial integration is more likely to produce academic benefits for nonwhite and low-income students than the creation and maintenance of segregated charter schools. This linkage is particularly profound when it comes to charter schools. From their conception, charters have been explicitly proposed as a means of improving school outcomes for students of color, who, it has long been understood, suffer from lack of access to educational opportunity. In the original charter proposal put forward by the Twin Cities Citizen's League, these predicted improvements would have come because of improved integration.1 As a product of school choice, charters, it was theorized, would be more integrated than traditional public schools, and would thus produce superior academic performance. Over time, however, charter advocates have moved towards the position that charters will produce academic equality - or in their parlance, "narrow the achievement gap" - through special targeting, not universal instruction. In this view, charters have increased flexibility and incentive to innovate, and are therefore well-suited to provide underprivileged students what has historically been known as "compensatory education." The ostensibly innovative methods adopted by charters would allow them to avoid pitfalls found in traditional schools, providing a superior education to their segregated traditional school competitors - albeit in an equally segregated environment. In Minnesota, as in most of the country, this second approach has come to define the charter industry. Consequently, a racially divided charter system has emerged. On one hand, the Twin Cities contain a body of white-segregated and diverse charters, such as classical academies, European language immersion schools, and Montessori schools. These "oddball" charters fill small, narrow educational niches - often niches sought by affluent white parents. They are typically located in diversifying suburbs, though a handful of the whitest institutions can be found in the central cities, often suspiciously close to much more diverse traditional public schools. 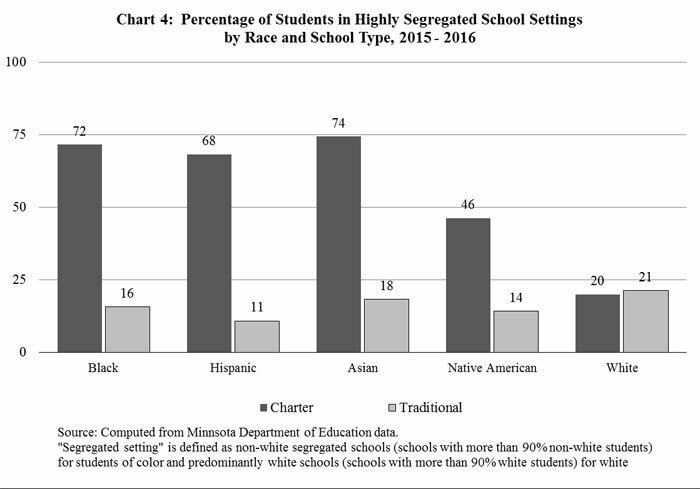 On the other hand, there are the schools that constitute the majority of Minnesota's charter sector: the segregated poverty academies, sometimes serving almost entirely homogeneous student bodies. Many of these schools are true single-race schools. Some explicitly target and recruit students from particular racial or "cultural" groups. These schools are built around the idea of making segregated education work. Rather than providing facilities, curriculums, and staff to educate the full, diverse range of students that make up the Twin Cities, they narrowly target a single subset of students, often by race and income. This distinguishes them from traditional public schools, which, at least in theory if not in practice, are structured to serve all comers regardless of socioeconomic status. A similar spectrum of charter education exists in other cities and states. But in other regions, segregated charters are often located in racially isolated school districts. In those places, segregated charters are able to claim to be merely adapting to realities on the ground - after all, the nearby traditional public schools are equally segregated. While the number of highly segregated public schools is growing in the Twin Cities, they are still far rarer than in cities such as Detroit or Chicago. Charters seeking to provide single-race remedial instruction have been forced to create a segregated environment that is far more racially isolated than the traditional public school system. The result has been a region in which 45 of the 50 most segregated schools are charters. The Twin Cities region contains 78 schools that are more than 95 percent nonwhite; of these, 59, or 76 percent, are charter schools. Unsurprisingly, children of color at charters are vastly more likely to attend a segregated school than children of color at traditional public schools. In short, charter schools are at the vanguard of Minnesota educational segregation. From an academic perspective, the complex interplay of segregation, integration, and academic performance in the Twin Cities creates several opportunities to analyze the impact of charter schools. It provides a powerful case in which to examine the claims of two competing, and mutually exclusive, methods of improving the academic performance of children of color: the civil rights preference for integrated schools, and the charter industry's preference for highly segregated schools that focus on "compensatory education" for disadvantaged groups. Charter school advocates have consistently maintained that Minnesota charters improve student performance across the board. 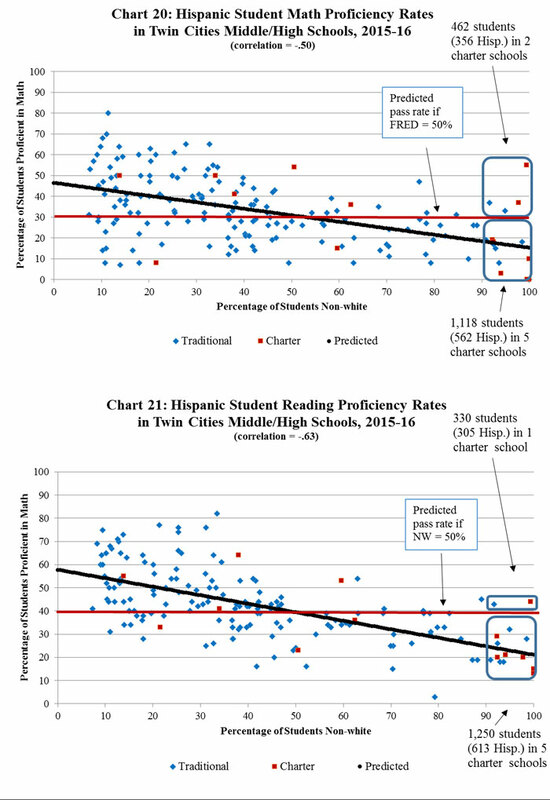 Previous reports from the Institute on Metropolitan Opportunity in 2008, 2012, and 2013 have demonstrated that this is not the case when student demographics and other school characteristics are controlled for.4 This section updates the performance analyses from the previous IMO studies, which focused on Twin Cities charters in the aggregate, with the most recent data. Before subdividing the charter sector for closer analysis, it is important to understand that charters as a whole have no special formula for academic success, and indeed seem to underperform traditional schools. 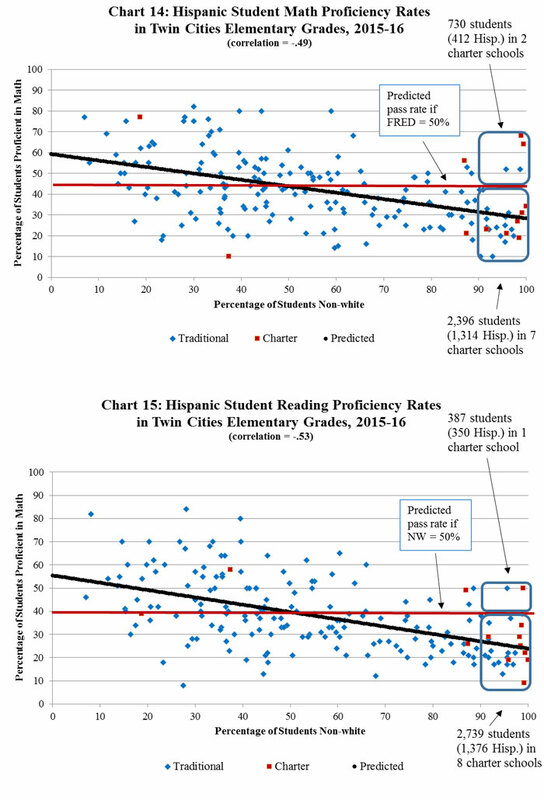 IMO's 2008, 2012 and 2013 studies produced evidence that charter schools in the Twin Cities were not out-performing elementary traditional schools on state math and reading tests. The same models were rerun with data for the 2013-14 and 2014-15 school years.5 Table 1 summarizes the results of this analysis, which indicates the difference between the charter and traditional school elementary pass rate in each subject. Although the absolute difference between student pass rates for math and reading in charters and traditional schools varies a bit, the findings are, on the whole, remarkably stable. 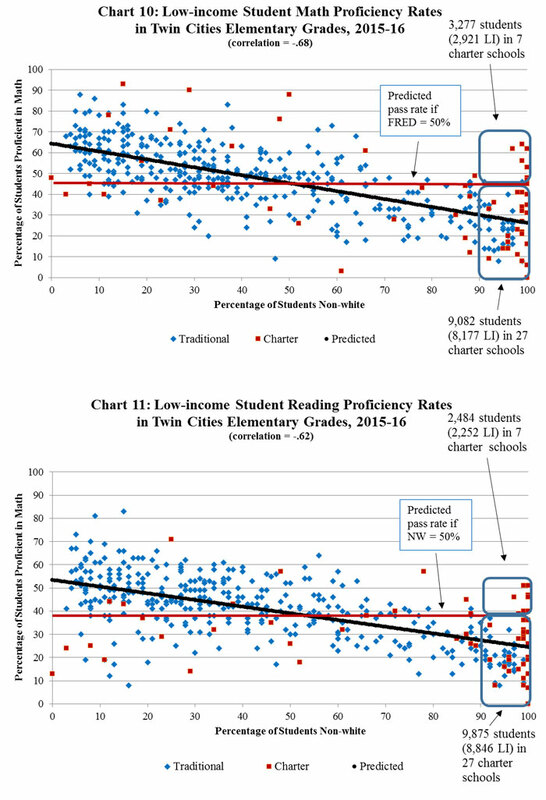 Elementary school charters underperform their traditional counterparts in all years in both math and reading. After controlling for school demographics pass rates in charter school, math pass rates were between 7.5 percent and 11.2 percent lower in charters while reading pass rate shortfalls varied between 4.4 percent and 9.6 percent. In 2015-16, the math performance of students in only 41 percent of charter schools was better than expected given the poverty levels of these schools - the rest, 59 percent, under-performed expectations. In contrast, more than half of traditional elementary schools out-performed expectations. The results are very similar for reading pass rates. The inability of Twin Cities charter advocates to produce evidence of across-the-board charter achievement gains has helped shift the focus of the public debate. Over time, advocacy has focused increasingly on the majority of charters with a high degree of economic and racial segregation. It is in these schools, advocates claim, where the academic benefits of charterization are realized. Before addressing the claim that segregated charters are high-performing, it should be noted that this assertion is, at minimum, extremely counterintuitive. This is because decades of empirical social science research has created a strong consensus that segregation, regardless of whether it is created by government fiat or a combination of other factors, causes significant harm to students. In a similar vein, research also clearly shows that integration generates a bevy of benefits for students, many of which have lasting, lifelong effects. These benefits are shared by white and nonwhite students alike. On the other hand, minority students who attend segregated schools are more likely to enter the juvenile justice system, and when they graduate, more likely to enter the criminal justice system.14 These effects are life-long and life-altering. At times, charter advocates have attacked the benefits of school integration as the product of mystical thinking. A common refrain is that integration strategies are premised on the idea that "black children can't learn without white children" or there are magical educational qualities implicit in "seating black kids next to white kids." In reality, there are several concrete mechanisms through which integration confers its benefits. But resource allocation is not the only mechanism through which segregation and integration have an impact. After all, if it were, negative effects could be erased by simply redistributing resources--and Minnesota's own experience proves this is not the case. Minnesota is comparatively successful at allocating financial resources in accordance with need. In the Twin Cities, there is a strong positive correlation between segregation and state financial allocations to a school; highly-segregated, high-poverty schools and districts might spend twice as much per student as predominantly white schools and districts. If this progressive distribution of resources is having an ameliorative effect on racial gaps, however, it has been far from sufficient to prevent large racial disparities from emerging. Instead, other mechanisms are at work. Peer effects are an important component of student achievement. Alongside a student's own socioeconomic status, a major predictor of student performance is the socioeconomic status of a students' peers. In effect, students in a school are learning from their peers as well as their teachers.22 This means that the deleterious effects of poverty on learning can be insulated somewhat through exposure to middle-income classmates. Another important factor in student outcomes - especially "real world" outcomes like college attendance, adult employment, and career choice - is exposure to social and professional networks. Few people succeed on the basis of merit alone; career and social advancement typically rely to some extent on contacts in business or academia. Not all social networks are equal: some are more expansive than others, and include more influential or higher-profile connections. Historical segregation and racial inequality has the effect of limiting the networks available within nonwhite-segregated schools, thereby allowing white students privileged access to many social spheres. Since access to these networks is often merely a matter of proximity and exposure, integration can help provide equal opportunity for that white and nonwhite children. Integration improves students' lives in other ways that are harder to quantify. Across centuries, the United States has developed what is effectively a racial caste system, inculcating in its citizens a belief that racial groupings are important determinants of who succeeds and what role people play in society. Strict school segregation was originally instituted for the express aim of advancing this system and the ideas underlying it. In short, school segregation, whatever its cause, strengthens socially constructed racial categories and helps build the framework for future racial oppression and inequality. Integration tears down that framework and contributes to a society where an individual's racial identity is not a predictor of life trajectory. Modern debates about school segregation sometimes attempt to detach it from its historical context and address it as a purely technical matter, a sort of "policy treatment" that can be dispassionately evaluated. It is important to remember, however, that segregation has played an instrumental role in creating and maintaining America's de facto racial hierarchy and thus has a political and social resonance that most policy issues lack. Over a third of whites - 34 percent - said it was "not at all important" to send their child to a diverse school. In the same poll, half of black respondents said they'd prefer a distant school that was integrated to a nearby, homogeneous school; among whites, 67 prefer racially isolated neighborhood schools. Similarly, 61 percent of black respondents said that the government should make sure schools are racially balanced, with 17 percent opposed. Among white respondents, 28 percent of respondents support government action to achieve racial balance while 42 percent are opposed. These figures are important to keep in mind going forward. Despite the tremendous benefits provided by integration, it has proven difficult to create and maintain in piecemeal fashion - a problem that can be largely be attributed to the historical and ongoing preference of white parents for educational enclaves. Segregation in Twin Cities charter schools is severe and increasing. The Institute on Metropolitan Opportunity's previous reports on the subject in 2008, 2012, and 2013 all found high levels of racial isolation. Little has changed today. For students of color, segregation has continued to worsen at Minnesota charters. In the 2015-16 school year, most nonwhite charter students were at segregated schools where more than 60 percent of the student population is nonwhite, including 88 percent of black students, 78 percent of Hispanic students, 80 percent of Asian students, and 64 percent of Native American students (Chart 3). 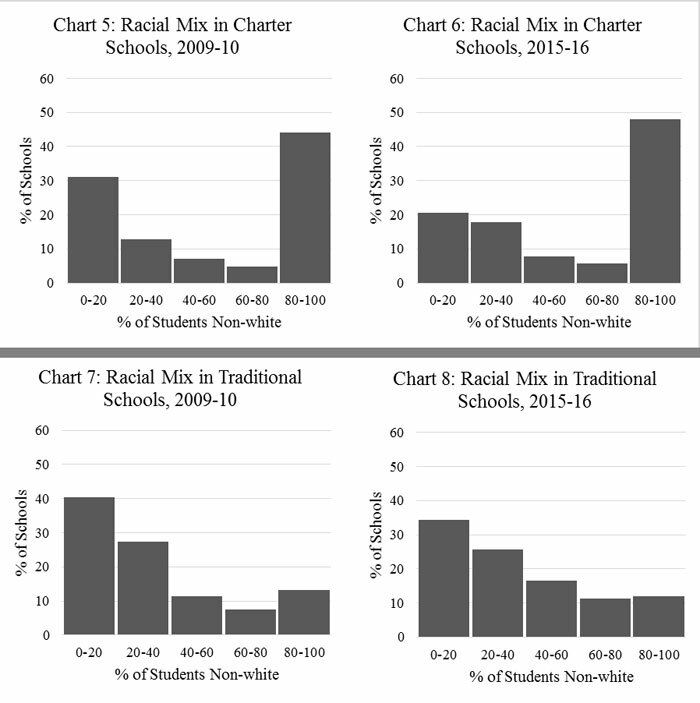 But these figures understate the severity of racial isolation at charters. That is because a huge number of charter schools are not just segregated, but highly segregated, with student populations that are more than 90 percent nonwhite. Indeed, as seen in Chart 4, 72 percent of black students, 68 percent of Hispanic students, and 74 percent of Asian students at charters are attending a highly segregated school. Here, too, segregation is worsening: in each case, these figures represent an increase over the previous year. For comparison, at traditional schools, no more than 18 percent of any nonwhite student group attends highly segregated schools. Evidence suggests that this increase in segregation in Minnesota charters is driven almost entirely by the formation and growth of the sort of highly-segregated remedially-oriented academies that are found often found in high-poverty areas. For instance, while nonwhite segregation has increased, there has been a small but noticeable reduction in the number of white-segregated charter schools (Table 1). Source: Computed from Minnesota Department of Education data.Predominantly White: non-white student share < 20%; Non-white Segregated: non-white student share > 60%;Diverse: non-white student share between 20% and 60%. Nonetheless, the defining feature of charter demographics continues to be extreme rates of segregation. This is perhaps best reflected by a "missing middle" among charters: the relative absence of racially diverse, integrated schools. 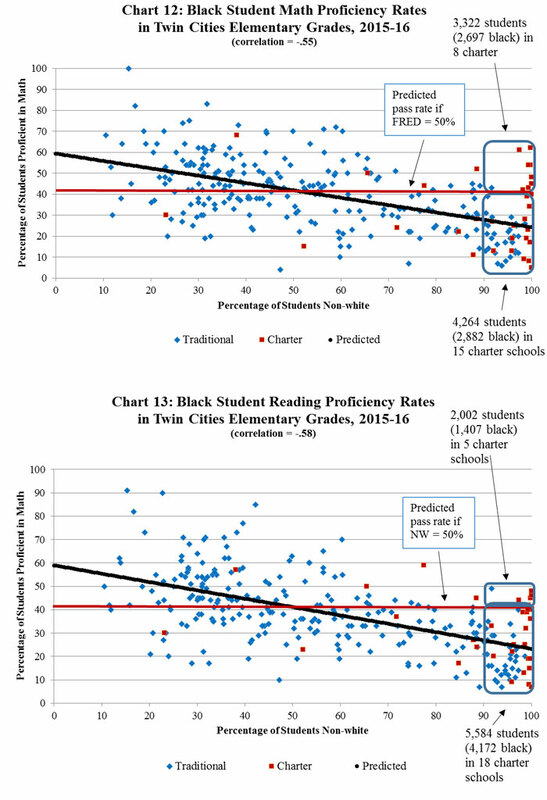 Instead, Twin Cities charters are bimodally distributed: a great many are heavily nonwhite, and a large number are heavily white, but vanishingly few are between 40 and 80 percent nonwhite (Chart 6). Traditional schools show a much flatter distribution (Chart 8). Another lesson of these figures is that there appears to be only one pathway to the creation racially diverse charters: integrating students of color into schools that were previously heavily white. The number of schools that are predominantly white is decreasing, while the number of lightly integrated schools, with student populations between 20 and 40 percent nonwhite, is increasing. 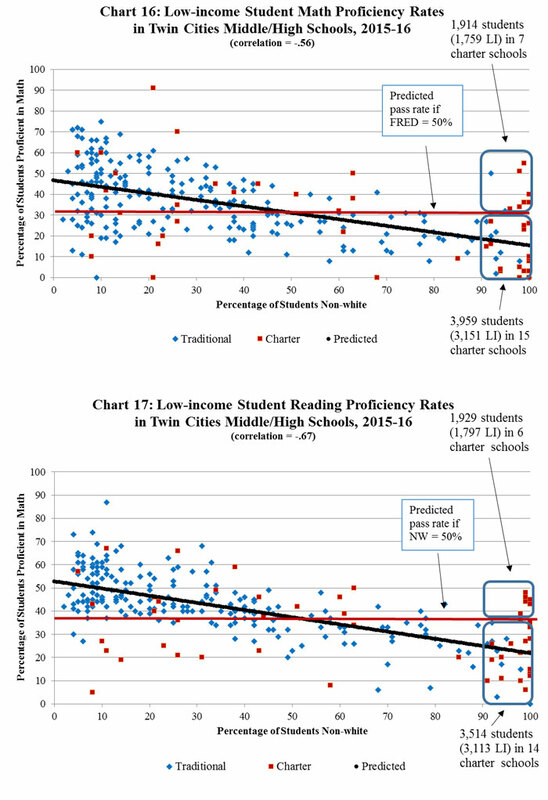 (Charts 7 and 8 show a similar trend occurring in Twin Cities traditional public schools.) By contrast, there is virtually no movement in the other direction - no indication that more white students are attending heavily nonwhite schools. Indeed, the percentage of charter more than 80 percent nonwhite has increased. This can be seen by comparing Charts 5 and 6, below. 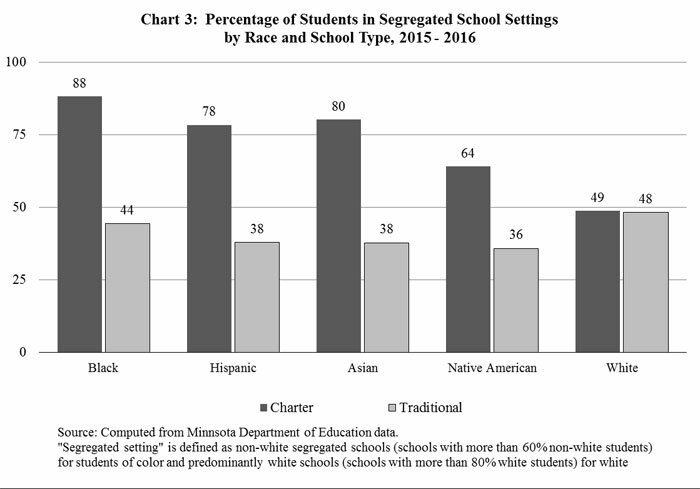 Whatever rationale is provided for them, there is little question that the popularity of these schools within the charter industry has contributed to extremely high - and increasing - overall levels of racial segregation among charters. In legal proceedings and in the press, Twin Cities charter proponents have defended poverty academies by focusing heavily on a handful of schools that "beat the odds. "28 There is a group of roughly a dozen high-poverty charters exhibiting pass rates significantly better than predicted by regression models, and for the most part, performing better than their traditional public school counter-parts. This group has emerged over the previous decade. Absent more concrete evidence, there is no empirical justification for cherry-picking high-performing schools for analysis. Nonetheless, in the aggregate, the most segregated poverty academies seem to produce higher test scores than equivalently segregated traditional public schools. A student at a racially homogeneous poverty academy with an entirely black or Hispanic student body is somewhat more likely to be proficient on state exams than a student at a traditional school with identical demographics. It must be emphasized that this finding alone cannot vindicate those charters' methods, for two important reasons. First, key questions about these achievement gains remain unanswered. Most notably, charters nationwide have been accused of producing high test scores by screening out low-achieving students. Screening may be a particular danger in the instance of the Twin Cities' so-called "culturally-focused" schools, which are already targeting a narrow segment of students from a much more diverse population. These enrollment methods create ample opportunity and incentive to screen - for example, by failing to recruit the most troubled children as potential enrollees. 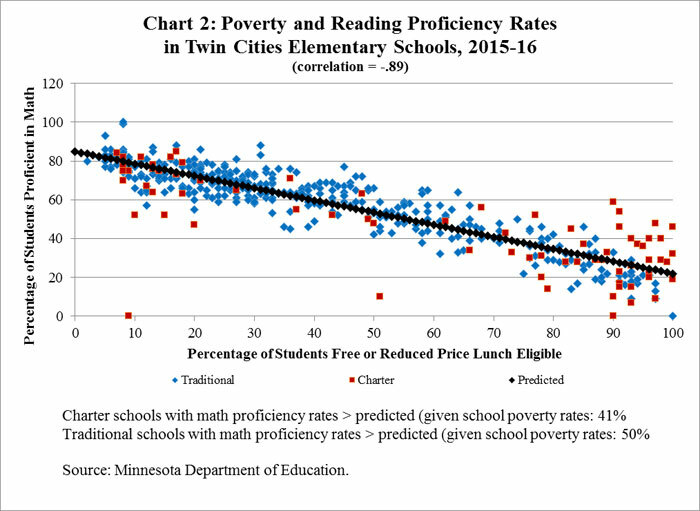 Analysis of enrollment trends does indeed produce considerable evidence of screening in Twin Cities poverty academies. For instance, many higher-performing poverty academies serve notably fewer special education students than traditional schools with similar racial demographics. This tends to inflate the reported differences in test scores between higher-performing charters and traditional schools. These trends will be discussed in subsequent reports. The second major caveat is that while poverty academies produce higher proficiency than equivalently segregated traditional schools, very few traditional Minnesota schools are equivalently segregated. Instead, the comparison relies almost entirely on the predicted performance of hypothetical schools. One way to think of this is to recognize that the poverty academy model was designed for intensely segregated cities such as Detroit or Chicago; in cities where racial concentration is lower, poverty academies seem to proactively intensify it. It is only at these profound, unnatural extremes of racial isolation where charters compare favorably to traditional schools. The efforts of poverty academies to create and protect high levels of segregation will also be documented in subsequent reports. But even taking the most favorable set of assumptions about poverty academies - that they genuinely improve academic performance of low-income and nonwhite students through innovation, and that intentionally creating segregation is legally and ethically permissible - a question still remains. Is the creation of these schools a better educational strategy than pursuing racial integration, which is also proven to create significant benefits? The creation of poverty academies and the fostering of school integration are mutually exclusive, because poverty academies - by definition narrowly targeted institutions - cannot be integrated. For policymakers, this creates a stark choice about how to improve the academic performance of disadvantaged students. This section seeks to answer two questions about that choice. Do poverty academies provide academic performance that is superior to integrated schools? And if not, what level of integration is necessary to achieve greater academic gains than those produced by poverty academies? Our analysis suggests that even very low levels of integration can produce greater academic gains than can be reliably produced by poverty academies that are more than 90 percent nonwhite. The poverty academies can be found at the far right-hand side of the charts. The charter schools above the black line are the "beat the odds" schools used to defend the concept of segregated charter education. In the aggregate, the poverty academies seem to produce higher academic performance than the (very few) equivalently segregated traditional public schools with the same level of racial concentration. With this said, the poverty academies do not produce reliable academic performance gains, as each chart contains a substantial number of schools "below the line." Among these schools, variations in student performance are very wide. This is especially true for for low-income students and black students. In addition, each of the charts also suggests that even very modest levels of school diversity are associated with performance increases that outstrip whatever gains are associated with poverty academies. The red lines on the charts show the predicted pass rate for each type of student in a school that is 50 percent nonwhite. For instance, in Chart 9, the red line indicates that the average pass rate for low-income students in a school that was 50 percent nonwhite in 2015-16 was about 46 percent. This pass rate for low-income students that was greater than the pass rate in 27 out of 34 charter schools that were more than 90 percent nonwhite. The same conclusion holds true in reading and math for low-income, black, and Hispanic elementary students: aggregated pass rates are substantially higher in a school that is 50 percent nonwhite than in highly segregated poverty academies. This same data can be reframed to answer a similar question: what level of integration would be necessary before predicted pass rates outstrip those found in poverty academies? In other words, how much do schools need to integrate until they're better than poverty academies? Table 3, below, provides an approximate answer to this question for black, Hispanic, and low-income students, in both elementary and middle/high grades. Chart 9: How Integrated Does a School Need to Be Before It Outperforms"Culturally Specific" Charters? When the white share of the student population exceeds the percentages above, predictedtest score performance for each group rises above observed test score performance for thegroup in segregated, "culturally specific" charters. Estimates use 2015-16 data fromthe Minnesota Department of Education. The data suggests that minimalistic or even token levels of integration produce academic performance comparable to that in poverty academies. For example, black students attending an elementary school in which only 19 percent of students are white would perform equivalently or better on average than would black students attending a segregated poverty academy, on average. Moreover, adopting integration as an educational strategy creates space for continual improvement. Continuing the above example, black students attending an elementary school in which 40 percent of students are white would be expected to considerably outperform the attendees of a segregated poverty academy. By gradually upping the level of integration in a school, the data imply that higher and higher levels achievement may be obtained. By contrast, the segregation of demographically similar students, even into ostensibly specially-tailored schools, is a pedagogical strategy with a very clear endpoint: 100 percent concentration. Most poverty academies are at or near this endpoint already, meaning that any future improvement is reliant on future, hypothetical educational innovation. 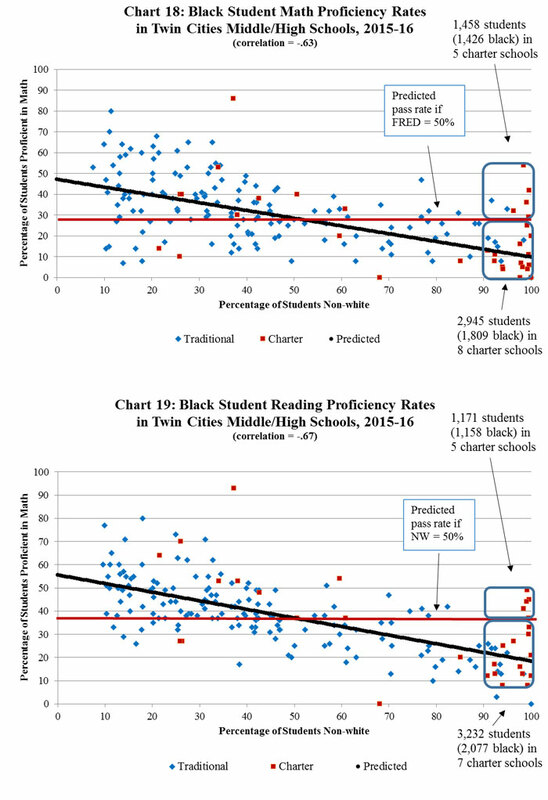 And it should be noted that this analysis likely overstates the performance of charter students, because it incorporates an unrealistically favorable set of assumptions for charters - it assumes that charter students are not differentiable from traditional school students along any dimension. In reality, as will be seen in subsequent reports, there is considerable evidence that charter schools have worked to tailor their student populations, with inexplicably low numbers of students in lower-performing groups, including special education students, homeless students, ESL students, and in at least one notable instance, male students. In sum, the data imply that even very modest efforts to integrate schools have the potential to improve low-income and non-white student performance beyond what all but the highest performing poverty academies can produce. When it comes to helping the most disadvantaged students, integration remains the strongest choice for Minnesota. **: Coefficicient significant at 99% confidence level. *: Coefficicient significant at 95% confidence level. Dependent variables: percentage of students meeting or exceeding standards in the relevant subject. All variables are measured for the 2014-15 school year. All elementary schools in the 11- county metropolitan area with more than 25 test takers and data for all variables are included in the analysis. 1 The Citizen's League report was one of the first, if not the first, detailed proposal for charter schools in the nation. Although the term had been used prior to the report, the Citizen's League described the idea in greater detail than any previous proposal. Most of its recommendations can still be seen in modern charters, with a key exception: it described compliance with integration rules as fundamental to the charter idea. Citizen's League, Chartered Schools = Choices for Educators + Quality for All Students (1988). 2 For instance, charter schools, granted an exemption from the state's desegregation/integration rule on policy grounds in 1999, have intervened in a recent school desegregation lawsuit in order to receive a declaratory judgment that the state is statutorily barred from applying its civil rights rules to them. For additional background, see Rachel M. Cohen, School Desegregation Threatens Charters, THE AMERICAN PROSPECT (Jan. 26, 2016). 3 For instance, a recent Atlantic article questioned whether "racial isolation is necessarily a bad thing," citing a prominent Twin Cities charter advocate. Natalie Gross, The Benefit of Racial Isolation, ATLANTIC (Feb. 8, 2017). 4 Institute on Race and Poverty, "Failed Promises: Assessing Charter Schools in the Twin Cities," November 2008 reviews several of these. IMO's updates of this study in 2012 and 2013 reinforced this finding. 5 Data was provided by the Minnesota Department of Education. 6 Comparisons represent regression coefficients from multiple regressions that control for school racial mix, percentage of students in limited English programs, percentage of students in special education programs, percentage of low-income students, attendance rate, mobility rates (inter-district and intra-district), school days per year, school minutes per day, whether schools are in a Choice is Yours participating suburban district, and total school enrollment. All of the measured shortfalls are statistically significant at the 95 percent confidence level. The full regression results are available in Table A.1 at the conclusion of this report. 7 The data needed for the regression is not yet available for 2015-16. However, sufficient data from that year is available to analyze poverty and school pass rates. 8 See, e.g., Stephen B. Billings, David J. Deming, and Jonah Rockoff, School Segregation, Educational Attainment, and Crime: Evidence from the End of Busing in Charlotte-Mecklenburg, 129 QUARTERLY JOURNAL OF ECONOMICS 435 (2013); Mark Berends & Roberto V. Penaloza, Increasing Racial Isolation and Test Score Gaps in Mathematics: A 30-Year Perspective, 112 TEACHERS COLL. REC. 978 (2010); Xiaoxia A. Newton, End-of-High-School Mathematics Attainment: How Did Students Get There? 112 TEACHERS COLL. REC. 1064 (2010). 9 Geoffrey D. Borman and N. Maritza Dowling, Schools and Inequality: A Multilevel Analysis of Coleman's Equality of Educational Opportunity Data (2006); Roslin Arlin Mickelson, Segregation and the SAT, 67 OHIO STATE L. JOURNAL 157 (2006); Kathryn Borman et al., Accountability in a Postdesegregation Era: The Continuing Significance of Racial Segregation in Florida's Schools, 41 AMERICAN EDUCATIONAL RESEARCH JOURNAL 605 (2004); Roslin Arlin Mickelson, The Academic Consequences of Desegregation and Segregation: Evidence from the Charlotte-Mecklenburg Schools, 81 NORTH CAROLINA L. REV. 1513 (2003). 10 Anthony Lising Antonio et al., Effects of Racial Diversity on Complex Thinking in College Students, 8 PSYCHOLOGICAL SCIENCE 507 (2004). 11 Mark Granovetter, The Micro Structure of School Desegregation, in SCHOOL DESEGREGATION RESEARCH: NEW DIRECTIONS IN SITUATIONAL ANALYSIS 81 (J. Prager, D. Longshore and M. Seeman eds., 1986). 12 Rucker C. Johnson, Long-run Impacts of School Desegregation & School Quality on Adult Attainments, NBER Working Paper No. 16664 (January 2011); Orley Ashenfelter, William J. Collins, and Albert Yoon, Evaluating the Role of Brown v. Board of Education in School Equalization, Desegregation, and the Income of African Americans, 8 AMERICAN LAW AND ECONOMICS REV. 213 (2006); Michael A. Boozer et al., Race and School Quality Since Brown v. Board of Education, BROOKINGS PAPERS ON ECONOMIC ACTIVITY: MICROECONOMICS 269 (1992). 13 Jomills H. Braddock and James M. McPartland, How Minorities Continue to Be Excluded from Equal Employment Opportunities: Research on Labor Market and Institutional Barriers, 43 JOURNAL OF SOCIAL ISSUES 5 (1987); R.L. Crain and J. Strauss, School Desegregation and Black Occupational Attainments: Results from a Long-Term Experiment (1985). 14 See, e.g., David A. Weiner, Byron F. Lutz, and Jens Ludwig, The Effects of School Desegregation on Crime, NBER Working Paper 15380 (2009). 15 Jomills H. Braddock, Robert L. Crain, and James M. McPartland, A Long-Term View of School Desegregation: Some Recent Studies of Graduates as Adults, 66 PHI DELTA KAPPAN 259 (1984). 16 Thomas Pettigrew and Linda Tropp, A Meta-Analytic Test of Intergroup Contact Theory, 90 JOURNAL OF PERSONALITY AND SOCIAL PSYCHOLOGY 751 (2006); Melanie Killen and Clark McKown, How Integrative Approaches to Intergroup Attitudes Advance the Field, 26 JOURNAL OF APPLIED DEVELOPMENTAL PSYCHOLOGY 612 (2005); Jennifer Jellison Holme, Amy Stuart Wells, and Anita Tijerina Revilla, Learning Through Experience: What Graduates Gained by Attending Desegregated High Schools, 38 EQUITY AND EXCELLENCE IN EDUCATION 14 (2005). 17 Michal Kurlaender and John T. Yun, Fifty Years After Brown: New Evidence of the Impact of School Racial Composition on Student Outcomes, 6 INTERNATIONAL JOURNAL OF EDUCATIONAL POLICY, RESEARCH AND PRACTICE 51 (2005). 18 RICHARD KAHLENBERG, ALL TOGETHER NOW: CREATING MIDDLE-CLASS SCHOOLS THROUGH PUBLIC SCHOOL CHOICE (2001); Maureen Hallinan and Richard Williams, The Stability of Students' Interracial Friendships, 52 AMERICAN SOCIOLOGICAL REVIEW 653 (1987). 19 See, e.g., Myron Orfield and Thomas F. Luce, America's Racially Diverse Suburbs: Opportunities and Challenges, 23 HOUSING POLICY DEBATE 395 (2013). 20 Erica Frankenberg, The Impact of School Segregation on Residential Housing Patterns: Mobile, Alabama, and Charlotte, North Carolina, in SCHOOL RESEGREGATION: MUST THE SOUTH TURN BACK? (John Charles Boger and Gary Orfield eds., 2005); MYRON ORFIELD AND THOMAS LUCE, MINORITY SUBURBANIZATION AND RACIAL CHANGE: STABLE INTEGRATION, NEIGHBORHOOD TRANSITION, AND THE NEED FOR REGIONAL APPROACHES (2005); Gary Orfield, Metropolitan School Desegregation: Impacts on Metropolitan Society, in IN PURSUIT OF A DREAM DEFERRED (john powell ed., 2001). 21 See, e.g., Sean Reardon, School Segregation and Racial Academic Achievement Gaps, CEPA Working Paper No. 15-12 (2015). 22 See, e.g., Douglas N. Harris, How Do School Peers Influence Student Educational Outcomes? Theory and Evidence from Economics and Other Social Sciences, 112 TEACHER'S COLLEGE RECORD 1163 (2010). 23 Studies have shown that racial isolation in schools at a young age creates adult preferences for same-race contact. Educational racial isolation appears to more strongly affect adult preferences than even residential racial isolation does. Jomills Henry Braddock II and Amaryllis Del Carmen Gonzalez, Social Isolation and Social Cohesion: The Effects of K-12 Neighborhood and School Segregation on Intergroup Orientations, 112 TEACHER'S COLLEGE RECORD 1631 (2010). 24 YouGov/Huffington Post, Poll on Racial Segregation (Jan. 20, 2016). 25 Data for 2014-15, not shown in Chart 3, are computed from the Minnesota Department of Education data. 26 "Segregation academies" would be an even more accurate term for these schools, as they tend to be more segregated by race than by income. (And they are often segregated by various nonwhite racial categories - for instance, some charter chains subdivide immigrant East African students and non-immigrant black students, despite both groups suffering from very high poverty.) However, the term "segregation academy" has an independent historical meaning that could potentially produce confusion. 27 See, e.g., Solvejg Wastvedt, No Conensus in Minnesota on Calls for Moratorium on Charter Schools, MPR (Sept. 23, 2016); Alejandro Matos, Minnesota School Integration Proposals Draw Fire, STAR TRIBUNE (Jan. 6, 2016); Beth Hawkins, Culture-Conscious Higher Ground Academy Serves Largely East African Student Body, MINNPOST (Jan. 31, 2013). 28 For instance, in an administrative law proceeding in 2016, charter advocates mentioned Harvest Preparatory no fewer than 23 times, often lauding it for being noted by the Minneapolis Star Tribune as a "beat the odds" school. Likewise, Higher Ground Academy was mentioned half a dozen times, and was also described on multiple occasions as a "beat the odds" school. Most of the dozens of low-performing Twin Cities charters were never mentioned a single time. Transcript of Record, In the Matter of the Proposed Rules Governing Achievement and Integration for Minnesota (2016). 29 Examples of long-lived, dismally performing schools are plentiful. St. Paul's Dugsi Academy, for instance, opened in 2006, and serves 315 students. Its academic proficiency, never high, has been falling over time. In 2012, 36 percent of students were proficient in reading and 18 percent in math; today, the figures are 7 percent and 5 percent, respectively. 30 This is true despite the fact that testing results for black, Hispanic and Asian students are suppressed for confidentiality reasons in many predominantly white (and lower poverty) schools because of low numbers of students. 31 See S. Wilder, Effects of Parental Involvement on Academic Achievement: A Meta-Synthesis, 66 EDUCATIONAL REVIEW 1-21 (2014); Valerie J. Shute, Eric G. Hansen, Jody S. Underwood, and Rim Razzouk, Review of the Relationship Between Parental Involvement and Secondary School Students' Academic Achievement, 2011 EDUCATION RESEARCH INTERNATIONAL; Ellen Goldring and Kristie Phillips, Parent Preferences and Parent Choices: The Public-Private Decision about School Choice, 23 JOURNAL OF EDUCATION POLICY 209-230 (2008); Robert Bifulco and Helen Ladd, Institutional Change and Coproduction of Public Services: The Effect of Charter Schools on Parental Involvement, 14 JOURNAL OF PUBLIC ADMINISTRATION RESEARCH AND THEORY 553-554 (2006).